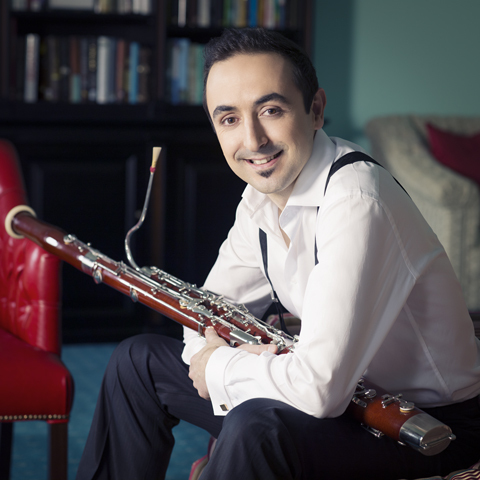 Although Rui Lopes only began studying the bassoon at eighteen, his musical temperament and virtuosity were quickly recognized and received many awards, including first prize in the prestigious Estoril International Competition. One of the most promising bassoonists of his generation, he shares his great passion for music with concert audiences all over the world. Rui has appeared as a soloist with Zurich Symphony Orchestra, Basel Symphony Orchestra, Czech Chamber Orchestra, Chamber Orchestra Kremlin, Finnish National Opera, Algarve Chamber Orchestra, Chamber Artists Orchestra, Beiras Philharmonia, Collegium Musicum Basel, Camerata Antiqua de Curitiba, Portuguese Symphony and other orchestras. He performs regularly with outstanding musicians including Konstantin Lifschitz, Patricia Kopatchinskaja, Alina Pogostkina, Razvan Popovici, Maximilian Hornung, Nabil Shehata, Marcelo Nisinman, Dimitri Ashkenazy, Sebastian Manz, Ramon Ortega, Nicholas Daniel and Loïc Schneider. Rui has played at the Schleswig-Holstein Music Festival, Festival Bohuslav Martinu, SoNoRo Festival, Crusell Festival, Oficina de Música de Curitiba, Lucerne and other festivals and worked with personalities such as Christoph Eschenbach, Jiri Belohlavek, Sakari Oramo, Esa-Pekka Salonen and Wynton Marsalis. As principal bassoon, he has performed with Lucerne Symphony Orchestra, Orchestre de Paris, Zurich Chamber Orchestra, Ensemble Modern Orchestra, Basel Chamber Orchestra, Festival Strings Lucerne and Camerata Bern. Rui’s principal recording, with the English Chamber Orchestra, is a CD with pieces by Vivaldi, Mozart, Elgar, Villa-Lobos and Françaix. This very special work, with two world premieres, includes Rui’s own arrangement of Edward Elgar’s Romance for Bassoon and String Orchestra (the original being for Bassoon and Symphony Orchestra) and the Jean Françaix ‘Divertissement pour Basson et Quintette ou Orchestre à Cordes’ which until now had been recorded only in the string quintet version. A fascination for Baroque and enthusiasm for Contemporary music have led from the study of early music on period instruments with Marc Vallon in Paris to the contemporary with Pascal Gallois and Pierre Boulez at the Lucerne Festival Academy, giving Rui an unusually broad repertoire. He works with the Ancient Music Capriccio Basel as well as contemporary music ensembles such as Music Factory and Ensemble Laboratorium, where he is founding member. His love for Argentinean Tango and Portuguese Fado styles often informs Rui’s own distinctive arrangements. Born in Portugal, Rui lives in Basel with Swiss wife Barbara and their two sons. He studied with Hugues Kesteman in Artave and Porto Music Academy, Sergio Azzolini at the Music Academy in Basel (soloist diploma with distinction) and with Marco Postinghel at the Richard Strauss Conservatory in Munich. Rui taught the bassoon and chamber music at the Aveiro University (2006-2010) and Metropolitana Academy (2010-2012) and teaches masterclasses. He plays a Peter de Koningh Baroque bassoon ‘after J.H. Eichentopf’ and a Heckel 13227 modern bassoon.